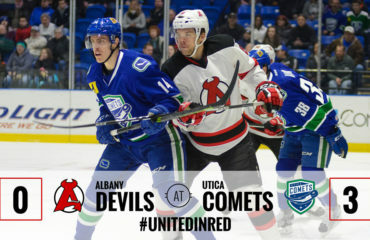 ALBANY, NY – Ben Sexton, Blake Coleman, Brian Gibbons and John Quenneville each registered a goal and an assist in the Albany Devils 6-1 victory over the Syracuse Crunch Wednesday at Times Union Center. 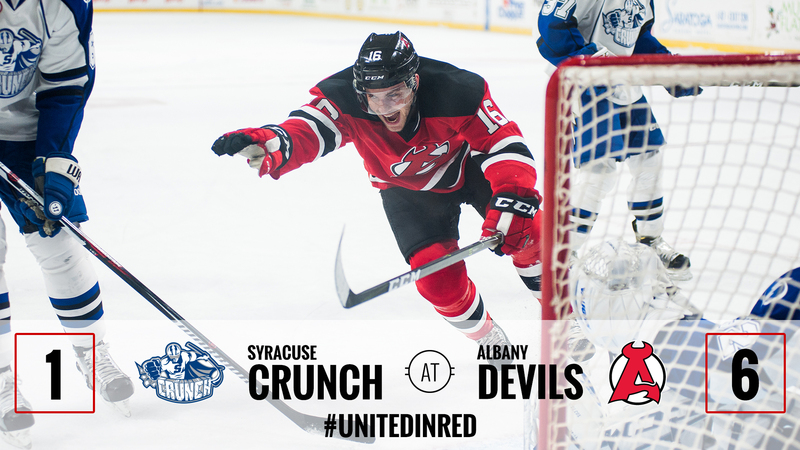 The Devils improve to 29-21-1-1 as the Crunch move to 25-16-4-5. Kevin Rooney gave the Devils a 1-0 lead at 15:22 of the first period after tipping in a Ryan Kujawinski wrister from the right circle. The goal was his ninth of the season with Kujawinski and Andrew MacWilliam picking up the assists on the play. Sexton followed at 18:20 on the power-play for his team high 18th goal as he tipped in a perfectly placed Quenneville pass in front of the net. Gibbons notched his 15th assist of the year on the tally. Gibbons extended the Devils lead to 3-0 at 12:39 of the second period with his 11th goal of the season. Coleman netted his 17th goal of the season at 14:26. Max Novak and MacWilliam picked up the assists. Quenneville furthered the lead with a power play tally at 16:18 to make it a 5-0 game. Yohann Auvitu and Sexton were credited the assists. The assist gave Sexton a Gordie Howe hattrick after a goal, an assist and a fight earlier in the period against Dominik Masin. Vojtech Mozik joined the scoring party at 19:21 to push the lead to 6-0 heading into the final period on a power play tally. 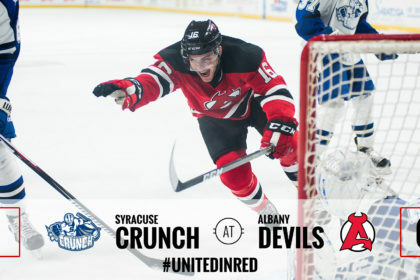 Adam Comrie scored the Crunch’s lone goal of the night at 4:34 of the third period, ending the Devils’ shutout bid. The Devils went three for eight on the power play and seven for seven on the penalty kill. Mackenzie Blackwood blocked 26 of the 27 shots he faced. 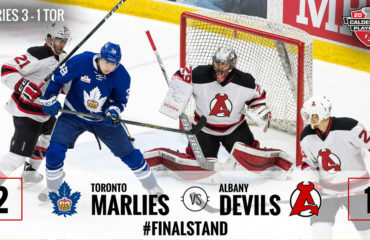 Adam Wilcox made 23 saves through two periods for the Crunch before being replaced by Kristers Gudlevskis, who sent away 6 shots. 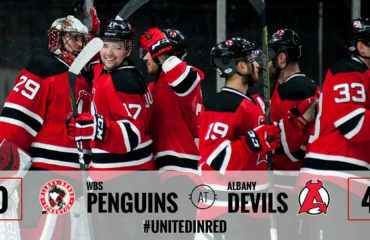 The Devils play the Wilkes-Barre/Scranton Penguins Friday at Times Union Center. Puck drop is at 7 pm.